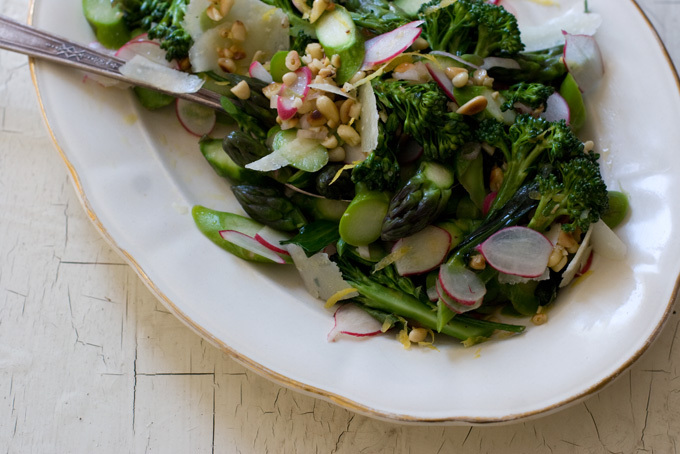 This is an adapted recipe version of the asparagus salad recipe from 101 cookbooks. I love asparagus! It’s one of my favorite vegetables for its taste and texture. It’s also a great natural dieuretic. I’ve been in a recent unconventional salad kick. I love spinach salads with mixed vegetables of different textures mixed up, but this salad is a fresh recipe perfect for summer. I mainly modified the recipe by blanching the vegetables, instead of sauteing the asparagus and brocolini. Blanching is a great way to bring the taste quality out of vegetables without ruining it’s crisp texture. In addition, I changed the dressing a little and used part olive oil and part ginger oil with a squeezed lime. This was all topped with some fresh sprouts. The asparagus and broccolini were blanched together. Sliced radishes were mixed in with the dressing and into the vegetable mix. Next, sliced almonds (original recipe called for pine nuts) were mixed in. Lastly, sprouts were placed ontop of the salad. I found my ginger oil at Whole Foods, but this could be substituted with 3 tbsp of olive oil (instead of 2 tbsp of olive oil) with fresh, minced ginger.